To look gorgeous and superb, smile is important. A good smile requires well aligned white teeth. Teeth whitening can help in this case. There are 3 teeth whitening systems – In office professional teeth whitening, professionally dispensed home teeth whitening and purchasing of over the counter teeth whitening products. People want teeth whitening because they do not like the color of their teeth. The color of our teeth changes due to certain reasons. Enamel is the outer shell of our tooth. Due to frequent wear and tear while eating and grinding, cracks would occur on the surfaces of enamel. These cracks would trap stains from colored drinks and food. These stains are called extrinsic stains where they could be removed with teeth whitening. If the stains have gone into dentine (second layer of a tooth) and bind with it, it is called intrinsic stains and it is difficult to whiten. Our tooth formation starts when we are still in the womb and continues until adolescence. In this period of time, should we or our mother take tetracycline (an antibiotic), our enamel would turn out to have brownish grayish ribbons. 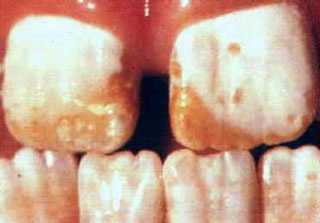 Drinking of high fluoride content water would cause dental fluorosis (white mottling or white flakes on our enamel). As we aged, our enamel becomes thinner due to wear and exposing the color of the dentine. The color of dentine is usually yellower. Besides, thinner surfaces take up stains real easily. Surely a person who favors colored drinks (colas, red wine, tea and coffee), food (carrots, oranges, dragon fruit) and smoking gets stained teeth easily. What are teeth whiteners made of? Teeth whitening agents usually consist of hydrogen peroxide or carbamide peroxide. They are bleaching agents that whiten tooth. Hydrogen peroxide is approximately 3 times more powerful than carbamide peroxide. Thus, it is use in in-office professional whitening. Carbamide peroxide is used in home whitening which it would slowly break down to hydrogen peroxide. How are teeth whitening done? Ways of doing tooth whitening differs with the severity of the staining. Intrinsic stains whiten better by in office professional whitening or long term home whitening. Over the counter whitening products would not help much in this case. After initial dental assessment of your condition, the color of your tooth would be determined in order for comparison after teeth whitening. Dentist would start the procedure by retracting your cheek and lips with a cheek retractor. The surfaces of your teeth are polished. After drying your teeth, a gum protector would be placed. Teeth whitening gel (9-40% hydrogen peroxide) is placed onto the teeth. A light source is shined to your teeth to activate the gel. This is carried out for 10 to 20 minutes in 3 to 4 intervals. Color of newly whitened teeth is compared. Fluoride gel is applied on clean whitened teeth to reduce sensitivity. You go back with perfect white teeth after 1 to 1 1/2 hour of treatment. Shade/color of teeth is predetermined for comparison after home whitening. Moulds of your teeth would be taken by the dentist to custom make a teeth whitening tray for you. Usually 2 trays are made for upper and lower jaw. 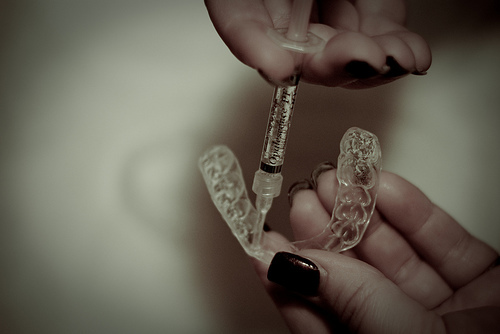 You will have to dispense the home whitening gel onto the mouth-guard-like tray and wear the tray overnight. Trays would be removed in the morning. This procedure is continued for at least one week. Repeated intervals vary depending on your satisfaction of teeth color. Consists of low levels of carbamide peroxide. Ranges from teeth whitening strips, teeth whitening toothpaste or mouth rinse, teeth whitening kits with self applicator or tooth whitening gel and fit-all-size-tray. Main disadvantage of teeth whitening is tooth sensitivity. But it usually lasts for 1 to 2 days. Fluoride gel could be applied if the sensitivity is severe. Certain degree of gum irritation would occur if the whitening agent contacts the gums. If ulcers occur, ulcer relieving agent could be used. Multiple colored teeth (Techicolor teeth) would occur if you have composite fillings, porcelain crowns or veneers on your teeth that you whiten as they will maintain their default color. So you need to redo the above mentioned to match the newly whitened shade. Teeth whitening are not advisable for kids under 13 years old. This entry was posted in Cosmetic Dentistry and tagged home teeth whitening, professional teeth whitening, teeth whitening, teeth whitening gel, teeth whitening kits, teeth whitening products, teeth whitening strips, teeth whitening systems, teeth whitening tray on August 6, 2009 by Dr Erica Tan.